PARIS (Reuters) - A French TV channel said on Wednesday it had been forced to cut short a live Facebook broadcast from a desecrated Jewish cemetery in eastern France because of an onslaught of anti-Semitic commentary. Separately, two swastikas and anti-Semitic slogans were found painted in red on a monument at a different cemetery near Lyon. "Our country is confronted with a resurgence of anti-Semitism undoubtedly without precedent since the Second World War," President Emmanuel Macron said later on Tuesday in an annual speech to Jewish leaders in France. 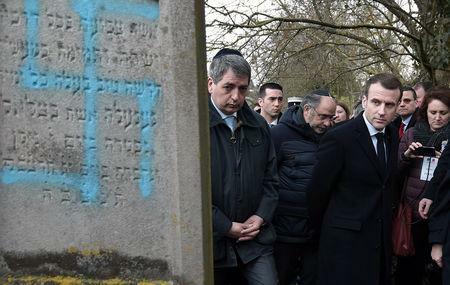 France 3 television said it went live from the first cemetery in the village of Quatzenheim on Tuesday as President Emmanuel Macron was visiting to pay his respects after more than 90 graves were vandalized with swastikas and anti-Semitic abuse. But as it broadcast footage online to its more than 1.3 million Facebook followers, the feed was inundated with anti-Semitic commentary and abuse. "We are talking about explicit death threats, comments that were openly anti-Semitic and racist, including "Heil Hitler", "dirty Jew" or "dirty Jews", comments that were addressed at Emmanuel Macron and representatives of the Jewish community," the channel said in a statement explaining its decision. "Within minutes, the number of vile and illegal comments had gone well beyond our capacity to moderate them," it explained, adding that it would have taken 10 or 20 staff to handle the onslaught. "We refuse to traffic in hatred." The attacks on the cemeteries are the latest in a series of incidents across France in recent weeks that have alarmed the Jewish community and prompted calls for harder hitting legislation against those responsible. In reaction to the upsurge in anti-Semitic incidents, Macron told Jewish leaders that a bill would be introduced by May aimed at curbing hate speech on the internet. Macron said it would require internet platforms to quickly take down hate speech and identify the authors. On Tuesday evening, some 20,000 people, joined by politicians from all parties, gathered at the Place de la Republique in central Paris to denounce anti-Semitism. Similar rallies were held in cities across the country. While France is home to the largest Jewish population in Europe, with a community of around 550,000 people, there continues to be a steady drip-feed of anti-Semitic attacks. Commentators have blamed incitement not only from the far-right but from the far-left and fringe Islamists. In 2018, the number of anti-Semitic incidents increased by 74 percent nationwide, figures released last week showed, despite having fallen somewhat in previous years.